GWA Group says it is committed to reducing energy, carbon emissions, water and waste across its operations and has an active program to achieve this. Our environmentally sustainable products are also a major source of competitive advantage for the Company, it said. GWA reports its annual carbon emissions under the National Greenhouse and Emissions Reporting (NGER) Scheme, and supplements this with a Sustainability Report. These reports are on its website. Energy World Corporation has released a comprehensive investor presentation it made to the CLSA Investors Forum. This contains information and many photographs of its modular LNG system and its gas power and LNG projects in Indonesia, Philippines, Papua New Guinea and Australia. Shares in CBD Energy touched a one year low of 3.2 cents on 7 September. Hunter Hall Investment Management has continued to sell down its stake in CBD, most recently from 10.09 to 9.03 per cent. CBD is encouraging consumers to ditch the grid and rising electricity costs with a system that combines rooftop solar and battery backup for energy storage and reuse. The grid is then used as a back up. CBD Energy Solar Manager, Jeff Bye, who recently installed a solar and battery storage system at his house, says such a system can pay for itself in about five years, meaning free electricity from then on. The average cost of energy is now between 20 and 30 cents a kilowatt hour, reaching 43 cents at peak. By comparison, solar energy costs between 5 and 7 cents a kilowatt hour to produce over the lifetime of a solar system of around 25 years. Improvements in technology being driven by the auto industry are leading to more efficient and effective battery storage, which works well with what can be intermittent production of electricity from solar power, he said. Clean TeQ Holdings has been chosen as one of the 2012 Artemis Top 50 emerging water technology companies in the world. The Artemis Project is a Californian non profit organization that helps water technology companies into the world market. "The Artemis Top 50 is the water industrys benchmark for innovation that will matter. It identifies the new solutions that will meet the world's water challenges, said Laura Shenkar, chair of the Artemis Top 50. Previous Artemis Top 50 emerging water companies such as 212 Resources, NanoH2O and Calera are said to now be some of the fastest growth companies in the global water sector. The Top 50 jury evaluated the technologies and business potential of 125 companies in depth. Three other companies selected from Australia were Baleen Filters, Bilexys and BioGill. Clean TeQ chief executive, Peter Voigt, said This award from the Artemis Project is acknowledgment from an independent group of water experts that our proprietary Clean TeQ ionic filtration based water technologies are targeted for success in the desalination market. Our market focus is in the desalination of dirty brackish water sources in the oil and gas and mining sectors for reuse in irrigation, livestock, and environmental discharge. Wherever possible we look to maximize the recovery of the treated water and produce economically valuable by products. ERM Power director Martin Greenberg indirectly disposed of 354,726 options which lapse on 6 June 2013 and have an exercise price of 80.6 cents each. Consideration for the off market transaction was $352,597. ERM Power has completed farm in transactions with Red Sky Energy Ltd and Clarence Moreton Resources Pty Ltd in the Clarence Moreton Basin in north east NSW. ERM Power will earn minimum equity interests of 50 per cent in petroleum exploration leases PEL 457 and 479, and 65 per cent in PEL 478 with options to increase to 100 per cent equity in each of the permits. ERM Power will also subscribe for 150 million shares in Red Sky Energy at 0.7 cents per share, giving it a shareholding of 9.5 per cent. ERM Power is interested in Red Skys conventional gas discovery. Managing director Philip St Baker said the transactions were consistent with the companys strategy of securing and developing gas prospects to support power generation and energy sales in the future. 2011-12 has been the worst year for some time for the August Investment portfolio and for green and sustainable investments in general, says the managing director of August Investments, Damien Lynch. Sustainable investments are at multi year lows. The American Cleantech index is at a 15 year low. August Investments share value is now back down to where it was in 2001, although we have also consistently paid dividends in that time. August Investments shares declined in value by 14.4 per cent during 2011-12, which was partially offset by dividends paid out equal to 4.1 per cent. It is of little consolation, but we are not alone, he said. In 2011-12 August Investments made a net loss of $52,922 against a net loss in 2010-11 of $31,870. The company paid an annual dividend of $10 per share as it did in 2010-11. This was a dividend yield of 5.16 per cent. But from December 2012 August Investments will reduce its half yearly dividend from $5 to $4 per share. The company has always paid fully franked dividends, but its store of franking credits is slowly reducing and it is reducing the amount per share to maintain the franking. However, once the sector does pick up, August Investments will be well positioned to take advantage of the benefits, he writes in the companys annual report. On the positive side, there has been a small improvement in Australian equity markets since 30 June 2012 and especially so for green and sustainable investments. The value of each August Investments share has increased by over 4.2 per cent in the two months since 30 June. Our most profitable investment has been Energy Action Ltd, which has increased by 27 per cent, plus they have paid a dividend equal to 1.5 per cent. However, there is no guarantee that his early trend will continue. We are continually reassessing our investments and looking for appropriate new investments for our portfolio. Most shareholders will not be aware that we have had a busy year working on business development for the August Investments brand. Within the ethical investment industry August Investments has a good reputation and is seen to be managed in a professional manner. During the year we were approached to be one of the fund managers for a new retail sustainable investment platform. Eventually we decided that the expense and time involved did not justify the risks and the potential rewards. "This is just one of the avenues we considered to extend our influence. We continue to examine other opportunities as they are presented, said Mr Lynch. Ceramic Fuel Cells (CFCL) has raised $6 million at six cents per share, and appointed Alasdair Locke as a non executive director and proposed chairman. The capital raising is from one of its strategic supply partners, a subsidiary of Chaozhou Three Circle (Group) Co., Ltd (CCTC). Based in China, CCTC is a manufacturer of electronic components and advanced ceramics and one of CFCLs key suppliers and manufacturers. CFCL has transfered its commercial cell production to CCTC, which has invested in building its own manufacturing equipment specifically to make CFCLs cells. CFCL is also working with CCTC to outsource other manufacturing processes and component supply to increase volume and reduce CFCLs product costs. The issue price to CCTC is the same as for CFCLs rights issue which closes on 17 September. All directors who are eligible to participate in the rights issue will take up their full or part entitlements. The subscription by CCTC is subject approvals from regulators in China. CCTC will hold about 6.8 per cent of CFCL. Mr Locke is based in London and is the founder and former executive chairman of Abbott Group plc, an oil services company he founded in 1990. It was listed on the London Stock Exchange from 1995 until its sale in 2008 for £906 million to a US private equity fund. Mr Locke, who started his career in investment banking at Citigroup in 1974, is also chairman of Argenta Holdings plc, an unlisted holding company which trades in the Lloyds of London Insurance Market, and non executive chairman of Hardy Oil and Gas plc. The board intends to appoint Mr Locke as chairman at the next annual general meeting in late October. He will also become a member of the Board Audit Committee and chairman of the Remuneration and Nomination Committee. Mr Locke has a beneficial interest in 67 million shares in the company, about 4.9 per cent of the equity. The current chairman, Jeff Harding, and deputy chairman, Roy Rose, will retire at the annual general meeting. Cardia Bioplastics said a leading multi-national hygiene and personal care company has commenced in-market validation of their personal care products packaging that is made from Cardias renewable Biohybrid resin technology. The undisclosed multi-national is collaborating with Cardia to improve the environmental profile of its packaging. The development process that leads to full commercialization is lengthy. The Biohybrid packaging has progressed to the in-market validation phase, confirming that the product meets the multi-nationals technical, environmental and cost standards, and has passed specific product trials. Shares in Clean Seas Tuna fell to an all time low of 1.5 cents on 10 September but quickly rebounded to around 2.5 cents. Frode Teigen has reduced his interest in Clean Seas Tuna from 11.59 to 10.52 per cent. In an update, the company said it is making significant progress in improving its Yellowtail Kingfish operations and Southern Bluefin Tuna propagation. The health of the kingfish is improving and mortalities are now on their way down. The company believes it has narrowed the possible cause of the Kingfishs health problems and work to confirm this plus mitigation and recovery solutions are underway. Genetically selected kingfish are being used for the next production run and this should improve our growth rates. Previously the company used only wild caught kingfish as broodstock. The company remains on target to achieve early tuna spawning. Up to 5,000 tuna fingerlings will be introduced to sea pens early in the summer of 2012-13. We have managed to sell significant surplus assets in line with our planned sell-down program, said chief executive, Craig Foster. Cash reserves will service to early 2013. A number of employees have been made redundant and the workforce is almost half of its early 2012 level. The LPG vehicle conversion market is at its lowest level since around 2003, said Orbital Corporation chief executive, Terry Stinson. Orbitals volumes of Liquid LPG system (Liquid LPi) which it is supplying to the EcoLPi Ford Falcon are well below what Orbital and Ford, expected, he said. However, Orbitals Orbital Autogas Systems (OAS) and Sprint Gas divisions have done a good job of adjusting their costs to their sales over the year. In a discussion with openbriefing.com. Mr Stinson said making a profit in this market is challenging but he believes the businesses are sustainable at current levels. There is very steady demand from commercial users that has always underpinned the LPG systems market and we can achieve profit, albeit slim, in that underlying market. The better question might be what happens when petrol prices go up? RedFlow received acceptances for $3 million under its rights issue at 6 cents per share. The issue was fully underwritten by RBS Morgans Corporate Limited and raised $4.9 million. The Chinese Government has regulated that light electric two wheel vehicles with a speed of between 20 kph and 50 kph and weighing more than 40 kg are now classified as scooters/ motorcycles. The new regulations mean that electric bicycles will be subject to rules that normally only apply to a scooter/motorcycle. They must have a registered number plate, the user may be required to have an electric two wheel vehicle driving licence, and the owner may need to have insurance for the vehicle to be used on the road. Electric scooter maker Vmoto said more light electric two wheel vehicles being classified and regulated as scooter/motorcycle should have positive implications for its business. Chinese companies that have only an electric bicycle manufacturing licence will need to cooperate with companies holding electric scooter/motorcycle manufacturing licences, such as Vmoto, to continue manufacturing their products. There should be more scope for future cooperation arrangements, which may include engaging Vmoto to manufacture electric two wheel vehicle products on an OEM basis, joint ventures or mergers. Vmoto is well placed to participate in all of these opportunities, it said. Electric two wheel vehicles are divided to three categories: electric bicycles, electric scooters, and electric motorcycles. These classifications vary substantially around the globe. Good and bad news continue for Lynas Corporation in Malaysia with the winning of a legal appeal but the Malaysian opposition coming out against the companys rare earths plant. Lynas and the Malaysian Government have successfully opposed an appeal against the High Court of Malayas dismissal of an application for a judicial review of the decision of the Malaysian Atomic Energy Licensing Board (AELB) to approve a Temporary Operating Licence (TOL) for the Lynas Advanced Materials Plant (LAMP) in Malaysia. The High Courts decision was appealed to the Court of Appeal and this was dismissed by the Malaysian Court of Appeal. Lynas said a similar group of applicants is seeking a judicial review of the June 2012 decision by the Minister of Innovation, Science and Technology, who dismissed a statutory appeal against the decision of the AELB to approve the TOL. Lynas and the Malaysian Government will also oppose this. The Government will offer to renew a number of Petroleum Exploration Licences in NSW, including all of Dart Energys licenses. Dart said it will be able to progress its well program, which is focused on gas supply to the domestic market. NSW imports 95 per cent of its and faces the prospect of an energy shortage and significantly higher gas prices with long term industrial and retail gas contracts expiring from 2015, said Mr de Weijer. Shares in Orocobre reached a one year high of $2.19 on 14 September. AnaeCo has strengthened its intellectual property (IP) portfolio with seven new International Applications under the Patent Co operation Treaty (PCT). The company has granted patents in several major countries for its two original patent families, and has two other International (PCT) Applications that were filed in 2012. The two original patent families cover the main DiCOM bioconversion process and the pressure aeration process, and are valid until 2020 and 2021 respectively. The nine new International (PCT) Applications cover aspects of the DiCOM System. Future national patents can be maintained until 2032. AnaeCo now has 18 months to select the countries in which it wishes to pursue national patent filings. Carnegie Wave Energy is one of two Australian cleantech companies shortlisted as a Global Top 30 2012 semi finalist by the Global Cleantech Cluster Association (GCCA). Carnegie said the Global Top 30 was chosen from an original field of 4,000 and that the GCCA Later Stage Award is for rising stars in the industry who are best positioned to attract investment for growth. Over the next three months, the companies will be judged by 28 cleantech venture capitalists, investors and entrepreneurs who have collectively invested over $3.5 billion in clean technology world wide. Head judge Dr Peter Adriaens, who helped develop the competitions selection method, said The 2012 Global Top 30 truly are the worlds top tier cleantech companies. Dyesol founder Dr Gavin Tulloch resigned from the board on 7 September. No reason was given. Tulloch Management Pty Ltd (TMPL), in which Mr Tulloch and Dyesol co-founder and director Sylvia Tulloch are shareholders, has had 168,023 shares sold by the liquidator to TMPL. These were sold on market at 11 cents per share. Kimberley Rare Earths has made two board changes with Ian Macpherson stepping down as chairman and being replaced by Jon Parker. Mr Macpherson continues as a non-executive director. Malcolm James has joined as a non-executive director and chairman of the Audit Committee. The company said Mr James will augment the boards skills, while rebalancing the roles of individual directors reflects their corporate accountabilities as the company seeks M&A opportunities. Mr James has over 30 years experience in merchant banking, engineering, manufacturing, mining, energy, financing, and philanthropic and social ventures. 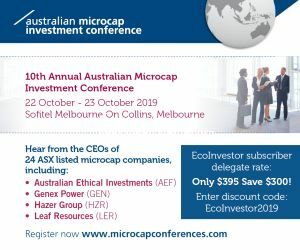 Over the past 25 years he has had roles in identifying, exploring, financing and developing significant natural resource and energy projects in Australia, the former Soviet Union, Middle East, Africa, Asia, South America and the USA. Liquefied Natural Gas Ltd has welcomed two positive developments. PetroChina International Investment (Australia) Pty Ltd (PetroChina Australia) has received confirmation from the Australian Foreign Investment Review Board (FIRB) that it has no objection to PetroChina Australias purchase of Molopos Queensland gas assets. The transaction now requires the approval of Chinas National Development and Reform Commission, which Molopo expects by the end of September. Liquefied Natural Gas said the significance for itself is that PetroChina Australia intends to deliver Molopos gas under a proposed tolling arrangement to LNG Ltds proposed 3 million tonne per annum Gladstone Fishermans Landing LNG Project in Queensland. Metgasco, in which LNG holds 10.2 per cent equity, has been granted a renewal of its Petroleum Explorations Licences 13 and 16; and its first Petroleum Production Lease. Metgasco has suspended trading of its shares before an announcement about a placement. Metgasco has welcomed new regulations for the coal seam gas industry, the renewal of its Petroleum Exploration Licences 13 and 16, and granting of its first Petroleum Production Lease. Peter Henderson, chief executive officer and managing director, said the Strategic Regional Land Use Policy (SRLUP), the Aquifer Interference Policy, Code of Practice and new well integrity standards send a clear message that the NSW Government is 100 per cent behind the coal seam gas industry. The NSW community should be confident now that yet another state government has thoroughly assessed the industry and given CSG a green light, he said. With the issuing of a Land Access Code of Conduct, which sets out the rights of landholders with respect to CSG activity, the SRLUP and the Aquifer Interference Policy, Northern Rivers farmers and the broader community can take great confidence that our industry is safe and can co exist with agriculture and other land uses, said Mr Henderson. It was disappointing that the industry had received so much unfounded criticism, creating unnecessary concerns in the community. The NSW Government has responded to these concerns by conducting detailed reviews and developing new regulations and community consultation processes. This policy work has caused significant delays for the industry in NSW. Furthermore, the time taken to complete the new policies has allowed community concerns to escalate. Metgasco will need to learn to live with the new regulations and processes. We expect that time will show that some of the new requirements are unnecessarily restrictive and that approval processes are cumbersome, adding unnecessary costs to the industry. CSG is a safe and environmentally attractive industry that can provide economic benefits in NSW and play an important role in securing energy supplies for NSW, said Mr Henderson.